With a class project to solve a social need, Blake Sorensen not only nailed the assignment, but he also launched a company. Blake struggled to find bars that were safe for his tree nut allergy, tasted great and matched his healthy lifestyle. A successful Kickstarter campaign proved he wasn’t alone and Blake’s Seed Based was launched. His commitment to taste was rivaled by his equally high standards to pick a manufacturer. Spoiler alert: the facility requires a pat down for nuts to enter! With the goal to donate one million bars to schools in need, through it’s Bar For a Box Program, Blake’s Seed Based is truly raising the bar. Tell us about that assignment. I think easy access to great tasting, not just safe, food is a social need for the food allergy community. I decided to try to make my own. I bought a food processor and an apron and got cooking. I brought Tupperware filled with bars to school and asked classmates to try them. I knew I was on to something when even people without food allergies liked them! What did people who didn’t know and love you think? It’s one thing for your friends and classmates to tell you they like your bars, but it’s another thing to see what strangers think. I decided to try a Kickstarter campaign, and the demand was overwhelming. I never realized how many people had food allergies until I launched the company. It was unbelievable how many people out there were just like me. I recently spoke to CNN about how many adults have food allergies. Tell us about the snack bars. We have three snack bars - raspberry, chocolate, and pineapple. They are free of the top 8 allergens as well as sesame and mustard. As a company, we are committed to always being free of those allergens. People love the taste of our bars and we were recently featured in Vogue. Your newest product line, protein bars, is a rare find! Finding great tasting bars was hard, but finding safe protein bars is practically impossible. We just launched two protein bars that come in mango lemon and chocolate mint. Each contains 15 grams of protein. These bars are perfect for a post-workout snack or as a meal replacement. As an athlete, I saw a lot of people snack on nuts to get protein. I always ate seeds since I can’t eat tree nuts, and while I’m not allergic to peanuts, I avoid them too. When I started to make the bars, seeds were top of mind. Canada’s far from Chicago. Why are your bars made there? I know first hand what’s on the line and how high the standards of manufacturing need to be. I spent a lot of time searching and wouldn’t stop until I found the best place that was Top 8 Allergen-Free. Safety is our highest priority. We finally found our home after months of looking - the facility literally pats you down to make sure you don’t have nuts on you. You’re a man on a mission - how is Blake’s Seed Based committed to giving back? Our goal is to donate 1 million bars. For every box we sell we are donating a bar to a school in need with the hope of providing the midday snack that the whole class can enjoy. We are starting locally, with schools on the south side of Chicago. The chef of your college football team was the ultimate team player! I played football at the University of Wisconsin-Madison, and the team provided all of our meals. I shared that I had a tree nut allergy before the season started my freshmen year and the chef made every meal, for all four years, nut-free. I’m sure the day I left they added nuts back to the menu! What's up with the parrot? I’m a huge Jimmy Buffet fan (Buffet fans are called parrot-heads). I associate his music with freedom and ease. Eating with food allergies can cause stress for many people, and I wanted our customers to feel a sense of freedom because they trust Blake’s Seed Based. How many bars do you eat a day? At least one or two. I’ll have a protein bar in the morning and a bar as a snack in the middle of the day. My favorite protein bar is mango lemon and my favorite snack bar is definitely pineapple! Chocolate chip and chocolate mint are customer favorites, but I prefer the fruit flavors. Follow Blake and see his 43 Reviews on the app! Follow @bsorensen in the Spokin app! What was your sweetest find on Spokin? I have always been worried about cross-contact when eating at an ice cream shop. Due to this, I avoided them. I saw Spokin’s feature on the Top-Rated Ice Cream Shops and saw Jeni’s which has a location in Chicago where I live. I read the reviews on the Spokin app, which gave me the confidence to give it a try. 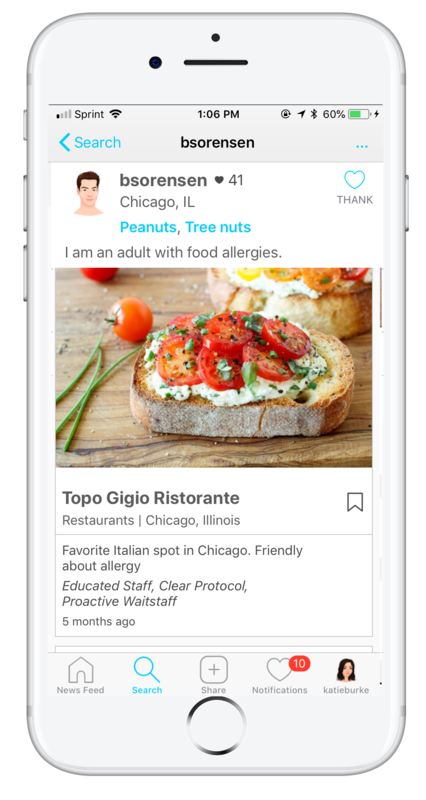 Trust is everything with food allergies and the reviews on Spokin are invaluable! Topo Gigio! It’s the best Italian food in Chicago. My two favorite dishes are their conchiglie all sarda pasta and the veal scallapini. You have such a healthy attitude! Where did that come from? I think it goes back to how I was raised. I’m the youngest of four boys, and my family is very close and positive. I’m the only one with food allergies, and it was just something we all worked around. I was always supported. We were taught success boils down to hard work, being kind, and being willing to learn and ask questions. Advocating for yourself with food allergies surely helped me hone those skills, and I choose to look at the positive. One last thing we have to know - who is your pick for the Super Bowl?